We’d love your help. 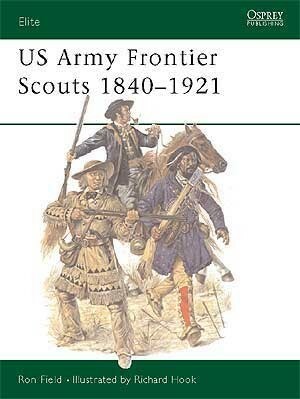 Let us know what’s wrong with this preview of US Army Frontier Scouts 1840–1921 by Ron Field. To ask other readers questions about US Army Frontier Scouts 1840–1921, please sign up. A fun little Edition in the Osprey Elite Series, this book covers the Indigenous Scout individuals and units that took part in the Indian and Civil Wars in the USA. The book follows the classic formula for Osprey- A history of the players, both single and units, then a description of their clothing and other equipment, with a nice selection of colour plates, fantastic illustrations by Richard Hook, in a center section. Frankly, aside from their participation in major wars and battles, the stories A fun little Edition in the Osprey Elite Series, this book covers the Indigenous Scout individuals and units that took part in the Indian and Civil Wars in the USA. The book follows the classic formula for Osprey- A history of the players, both single and units, then a description of their clothing and other equipment, with a nice selection of colour plates, fantastic illustrations by Richard Hook, in a center section. Frankly, aside from their participation in major wars and battles, the stories of these hardy folk seem like each one is a Western Movie waiting to be made. The scouts go after "hostiles", get in gun fights, ambush their quarry, use subterfuge and deceit to get their way. They go after kidnapped Settlers, they kill "Rogue Chiefs" and "Mad Medicine Men" and their followers. All of this against the amazing tableau of the American west. This is real boys own stuff, but the history is good and there is respect for all the tribes involved. It's a fun read that whets the appetite for more.